Description: When twin sisters Rose and Bel Enright enroll in The Odell School, a prestigious New Hampshire boarding school, it seems like the opportunity of a lifetime. But the sisters could not be more different. The school brings out a rivalry between them that few ever knew existed. And the school itself has a dark underbelly: of privileged kids running unchecked and uninhibited; of rituals and traditions that are more sinister than they seem; of wealth and entitlement that can only lead to disaster. Why I Picked This Book: I've been enjoying thrillers lately and the boarding school aspect of this one really appealed to me. The atmosphere - something is clearly not okay but it's hard to pinpoint if it's just teenagers misbehaving or something far more sinister. The changes in character POV - I really felt like I was seeing through each characters eyes and really got their perspective which added a lot of depth to the book. The beginning - Campbell does a good job of putting out enough information at the beginning to really hook me but still obscures it enough that I can't be quite sure what's going on. I'm not sure exactly what didn't work for me. It could have been that most of the characters were teenagers who really felt like teenagers which meant they were really caught up in all the insecurities and drama that accompanies being a teenager. It could have been the boarding school setting which did appeal to me but the Ruth Ware book set at a boarding school didn't really work for me either. Maybe the progress just wasn't quite quick enough? I don't really know but I did end up wanting the book to hurry up or skip ahead even though I was enjoying it which kept this from being a 4 star book for me. Overall, I think this is a case of it's not you it's me. I think the mystery and the pacing were well done and the atmosphere was splendid. However, I do find that books that feature a lot of teenagers in the cast seem to frustrate me so I'm thinking I'll pass on that subject as a whole from now on. However, I enjoyed the writing enough that I will be looking for more books from Michele Campbell. Would I Read More of this Series/Author? I would but I think I'll be looking for books that focus mostly on adults. I just don't think YA centered books really work for me. Would I Recommend this Book? Yes, I would. While it wasn't my favorite I did enjoy it! I can see how this book has some pluses for you and some minuses. I am really wondering who the murderer is and I think that is what would draw me in. Sounds like there is plenty going on in this one! 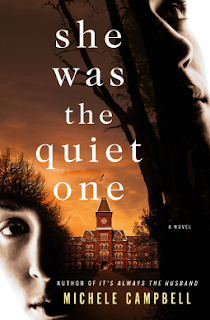 I like a good thriller but boarding school ya stories don't always work for me. I like ya but if there is too much teenage drama I don't find it as enjoyable. I do like books set at boarding schools and colleges and universities, etc. Not sure why, but I liked that aspect of Ruth Ware's book. So, that being said, I suspect this one would work better for me. Isn't it interesting to come to conclusions like this - what works better for us and what doesn't - what we can put up with and what makes us say 'not a good match'. Thanks for telling about it! I'm all about a mystery/thriller set in a boarding school, so I'm definitely going to read this one. Sorry it didn't work for you. I'm eager to see what I think of it. I won this one off of goodreads and need to get to it so I am glad you enjoyed it.